Something missing off the list? Tell us in the comments below! Why buy a typical Advent calendar when you could make an awesome geeky one? Instrucatbles user "Mischka" has created a fairly straightforward calendar, which requires no glue or soldering. You will need resistors, segment displays, a capacitor, and a battery among other parts, but the result is very simple calendar. Just push the button until December 24. Grab the instructions on Instructables. Lunchtime doesn't have to a plain affair, especially when there are mustaches involved! The Lunch Disguise takes an ordinary plastic sandwich bag and adds a big bushy mustache, as well as a monocle or a Groucho Marx-style mask. You can pick up a pack of 10 for $4.52 from Archie McPhee's awesome mustache collection. Although this toy is aimed at kids, you may find yourself wanting to have a go too. 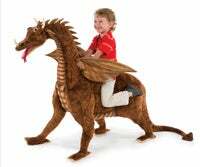 The Hammacher Schlemmer plush heirloom dragon is a great alternative to a rocking horse for the geeky child. Not only is it pretty tall, but can carry an impressive 150lbs of person too, so don't worry about breaking it if you decide to have a go at it. Unfortunately, it will set you back almost $1,000, though when you check out all the detailing on the giant lizard (note: it doesn't breathe fire), you'll see why. Here's something that plenty of geeks would love to display proudly on their dinnng room table: an eight-bit hourglass salt shaker. This oversized pixelated cursor is available over on Meninos, which also stocks some cool RSS related coasters. For extra kudos, fill this shaker with tasty bacon salt. Mmm. As the heading suggests, a knitted version of the Death Star from Star Wars is kinda cute. This is a great gift, too, if you think the Microbobe plush collection is a little bit much. 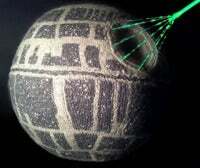 The aforementioned Death Star was made by crocheting (there is a difference!) a few colors and would certainly be a conversation piece. The best part? The pattern is a free downloadable. Check back tomorrow for more GeekBytes!